DELUXE HEDGEHOG SUPPLY PACKAGE ! This package includes all of our best hedgehog products. 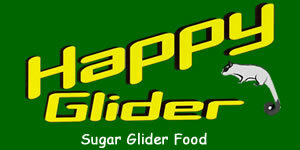 It is designed to give you all of the items necessary to fully enjoy your new pet! 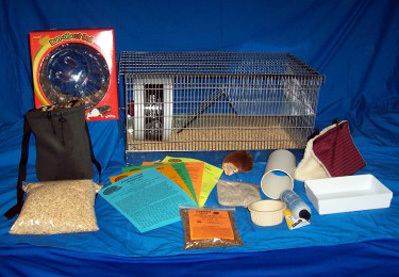 Deluxe Hedgehog starter cage set up featuring our multi-level design with loft & access ramp, crock style food dish, water bottle & hanger, litter pan & Litter, corn cob bedding, sleep tunnel, & a variety of care sheets & hedgehog care tips. A super cute novelty hedgehog resin figurine! This comical hedgehog figurine is absolutely adorable. Choose either the fellow looking straight on… or his curled up partner. Both have whimsical facial features and an exaggerated comical expression! 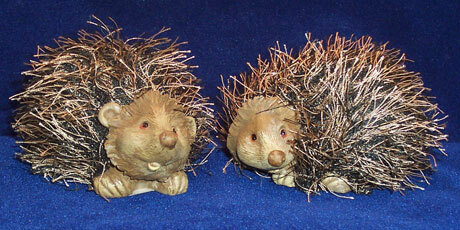 The clever use of soft material “quills” make either of these cuties a priceless keepsake. You will treasure this limited edition resin figurine for years to come! You save $45…or 22% off the regular price!!! If you are purchasing one of our baby hedgies and wish to take advantage of this GREAT SPECIAL OFFER, Just mention this promotion when yo are scheduling your appointment to pick up your baby hedgehog so that we will have your SPECIAL OFFER ready for you when you come.